There are few vegetarian options that I believe are just as good, or even better tasting than the meat they're replacing... soy chorizo is one of them. 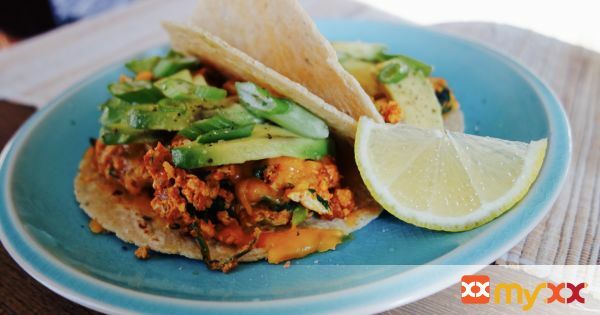 This meatless breakfast taco is easy to make, full of flavor, and guilt-free. 1. Heat tortillas in oven or on stove top till heated through and pliable without breaking. 2. Slice green onions, separating the whites from the green. Peel and slice avocado. Cut lemon into wedges. 3. Over medium heat, saute white parts of green onion, and spinach. Add soy chorizo once spinach has wilted and cook for about 1 minute. 4. Add eggs, scramble and cook through. Season with salt and pepper to taste. 5. Remove from heat and add cheese. 6. For each taco, add eggs, sliced avocado, green part of green onion, and a squeeze of lemon juice. Enjoy!